The versatile nature and capabilities of the blockchain make it the most important invention since the internet itself. The numerous features of the blockchain like non-repudiation, immutability, transparency, the integrity of data, authentication of sender and receiver, tamper-proof nature, added security, among others, make it a favorite technology among innovators and market players. The complications of the supply chain have made it cumbersome. There is involvement of several trusted parties for transfer of funds from one end to the other end of the supply chain; this makes the process faulty, costly and susceptible to threats. The process of supply chain involves handling of finance by bankers, contract by lawyers and above that the process makes tracking of product very difficult. Ultimately, making the whole process extremely sophisticated, dependent and cumbersome. 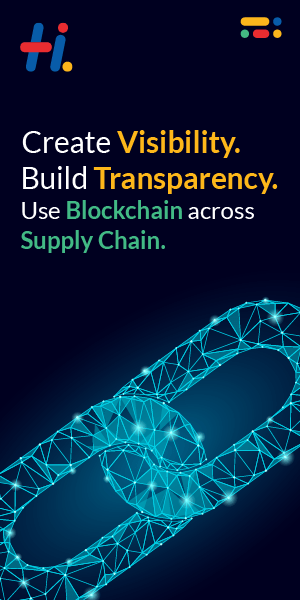 How can blockchain help in making supply chain efficient, independent and uncomplicated? The blockchain is immutable, i.e. once the data is input into the ledger, it can’t be altered. It makes consensus as per the democratic model. Every copy of the ledger stores the same version of the truth, thus finality is the crucial feature of the blockchain. The blockchain is already being employed by corporates to improve global supply chain, and experts think of it as&quot; the universal supply chain operating system. 1) Maintaining records of quantity and transfer of assets between supply chain nodes can be made efficient and transparent. 2) The blockchain allows instant and secure transfer of funds across the globe and the transfer is direct between payer and payee. Thus, the blockchain would automate the supplier payments, eliminating the need for the traditional banking system. 3) Traceability of product from one end of the supply chain to another end becomes easy with the blockchain, as it records the status of the product at each stage of production. The records are immutable and permanent. Purchase orders, change orders, receipts, shipment notifications, or other trade-related documents, can be tracked using the blockchain. The same is being done by Walmart to monitor the sale of pork meat in China. 4) The blockchain can be an excellent platform for cold chain monitoring. The blockchain supported platform can be used for assigning or verifying certifications or certain properties of physical products (which are necessary for food and pharmaceutical products). The blockchain can also be handy in linking physical goods to serial numbers, barcodes, digital tags like RFID, etc. 5) The whole process would become transparent as free information about the manufacturing process, assembly, delivery, and maintenance of products with suppliers and vendors will be shared. 6) The accessibility of the blockchain is not limited to big enterprises. Entities of any size can use blockchain. Recently, countries like Taiwan, China, and Germany are using the blockchain to sell and buy excess solar energy. Thus we witness the future penetration of the blockchain in our society. The blockchain can bring necessary reforms in our market.